I was recently asked to come up with a recipe using one of the new Cold Stone Creamery flavors of International Delight coffee creamers . International Delight has partnered with Coldstone Creamery to create three new flavors including, Founder’s Favorite, Hot for Cookie and Churro Caramel. I daydreamed a while about what I might come up with and I decided that I wanted something really tasty and decadent. I have been seeing a lot of variations of the mug cake lately and I knew that was it! If you are unfamiliar with mug cakes, they are exactly what they sound like, little cakes you make in a coffee mug . They are great for single servings or when you just want something quick and easy. I used the Sweet Cream flavored International Delight creamer and it tasted so good! I am glad it only made two servings because self-control is not exactly my strong suit. 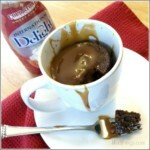 I used Sweet Cream flavored International Delight creamer and it tasted so good! I am glad it only made two servings because self-control is not exactly my strong suit. Mix all ingredients in a bowl and transfer to a (very) large greased mug. I used non-stick spray on mine. 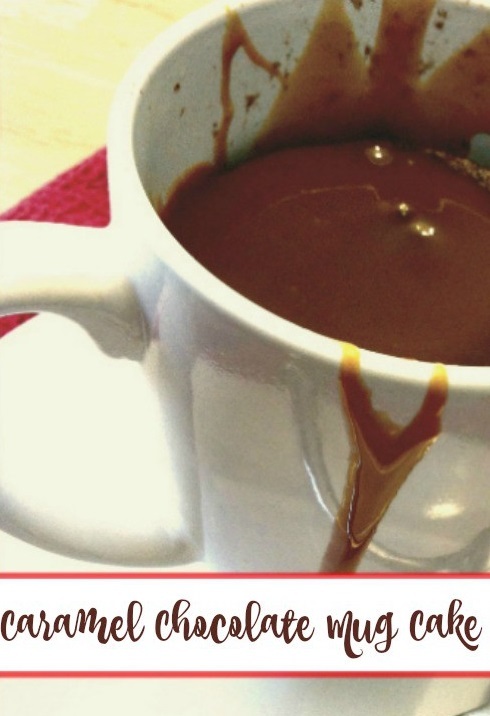 Microwave for 2.5-3 minutes depending on the wattage of your microwave and top with caramel! This recipe makes either one hearty serving or two tasty treats and would be amazing servied with some vanilla ice cream! Want more? I’ve shared a bunch of other easy – yet yummy – recipes! The NWF Be Out There ebook is officially here! And it’s free!